The name ‘Soka’ comes from the monogram So-Karen and also her passion for Soca music.She used passion, her strong background in the fine arts and love of fashion as her forte as an apparel designer, with her founding label Soka, in 2008. 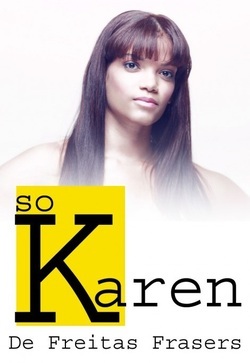 The name ‘Soka’ comes from the monogram So-Karen and also her passion for Soca music.Being only 22, Karen started her fashion life seriously at the age of 17. She began as a self taught designer interested in sportswear and worked under professionally trained Caribbean designers both in Martinique in 2007, where she resided for some time, and her homeland St. Vincent, taking all experiences gained and applying them to her work. In 2010 she experimented with Swimwear Design, and for 2011 she designed an accessory line. Currently she is located in New York, and is a first year student at Parsons: The New School for Design, pursuing a BFA in Fashion Design and interned with Fashion houses such as Zaralo LLC. Even though this is her third year as a professional designer, her designs have been featured in local shows in St. Vincent and the Grenadines. She produced her own show there dubbed, “GenX” 2009 and 2010. Regionally she showcased her work at Caribbean regional Fashion shows, first at the “Virgin Islands Fashion Week” , then “Islands of the World Fashion Week” in Bahamas 2008. Furthermore she has been featured as one of the Best Young designers of the Caribbean at SIWOTAGE; Fashion hits 2009. Internationally she has showcased at the 11th annual Miami Fashion week and Nolcha Fashion Week New York 2009. Also she has been featured in local and regional magazines such as SHE Caribbean, Posh Caribbean, Caribbean Styling and Panache JA magazine, March 2009. She is also a visual artist and an event decorator, having art exhibitions in her home land and also in other Caribbean islands and is building her portfolio as a fashion stylist here in New York.